The issue of whether a teacher can make a student turn his or her bracelet inside out has created quite a bit of debate during the past year. 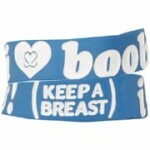 One trendy bracelet which happens to raise money as well as awareness about breast cancer is the ‘I (heart) boobies’ bracelet. Schools across the country have banned this bracelet, which have resulted in school suspensions as well as lawsuits filed against the school. As we are gearing up for the back to school time of year, we believe now is the perfect time to discuss the issue of rubber wristbands. These bracelets come in many different styles with tons of different messages written on them from supporting our troops to LGBT rights. Check out the following video and tell us what you think about the issue. Find out more about your free speech rights at school and a recent court decision involving the ‘I heart boobies’ bracelet. Here’s another example involving a student who fought for his right to wear his gay pride wristband. Teachers have to follow the law and students have to follow the rules. If the students don’t like it, then they students can leave their bracelets at home. The law is the law. The teacher has to follow the law and the student should respect and comply with the teacher’s orders. If the material contained on the outside of the bracelet would cause a substantial disruption under the Tinker standard, then yes teachers should have the right to tell their students to either turn the bracelet inside out or take it off altogether.